We would like to thanks Kazuki, Taka and Shiro for completing our Japan trip with a bang! They were extremely courteous and genuine and we had a lot of fun on this tour. keep up the good work and keep on smiling! Asakusa in downtown Tokyo is alive with a characteristic traditional ambience that removes you from the bustle of 21st century Tokyo. 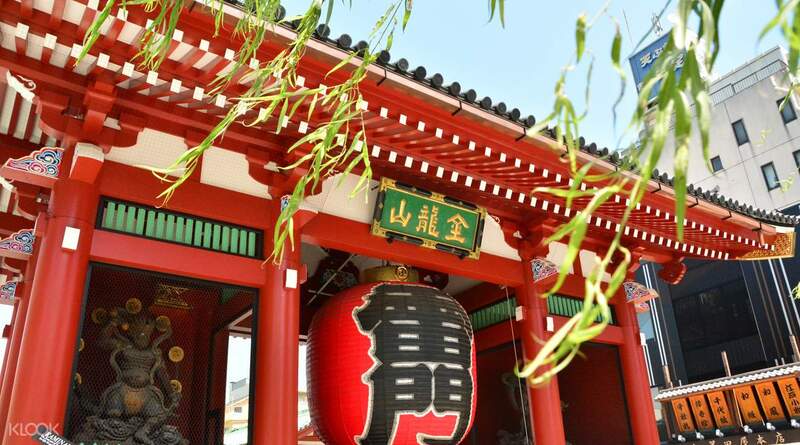 Swing by the famous Kaminari Gate, the entrance to the grand Sensoji Temple and have your rickshaw tour guide take pictures as you pose under the gate's giant red lantern before your departure. 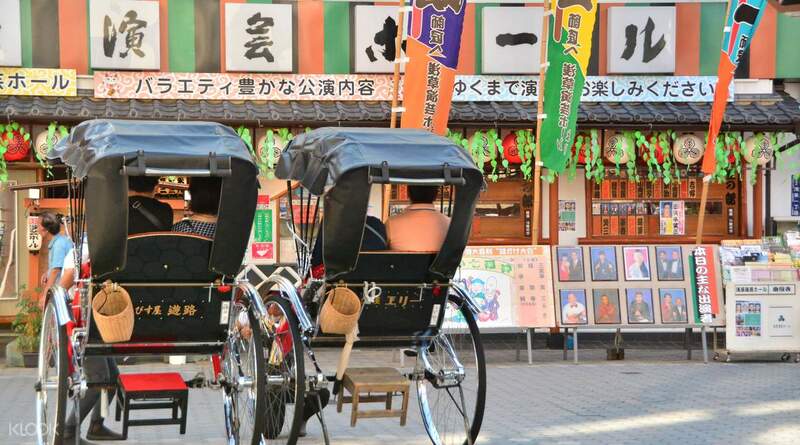 Explore the Nakamise Shopping Street or adjoining alleyways offering a wide variety of mouth-watering lunch options. 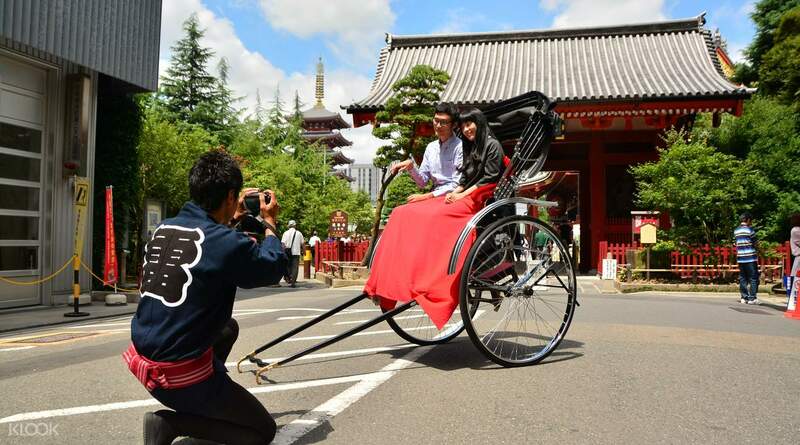 Travel between Asakusa's popular tourist destinations hassle-free, enjoy the city from a different height on a rickshaw perfect for two. Meet up point: just a few meters from the Kaminarimon (Your rickshaw driver will have the word 'Kaminari'/'雷' on his back). Highly recommended! Purchased the 2 hours tour and guide was very well versed. Brought us to the famous spots of Asakusa, including Temples and then dropped us back and recommended us nice restaurants and food places to dine at. At the end of the tour, gave us voucher discounts which can be used within 3 years. Will book this again in future when I go to other parts of Japan! Highly recommended! Purchased the 2 hours tour and guide was very well versed. Brought us to the famous spots of Asakusa, including Temples and then dropped us back and recommended us nice restaurants and food places to dine at. At the end of the tour, gave us voucher discounts which can be used within 3 years. Will book this again in future when I go to other parts of Japan! The experience was amazing for my whole family of 5. My parents took 1 rickshaw and my hubby, me and my 1-year-old took another. We chose the half an hour one just for an experience since we also booked the kimono experience. Service from the staff was exceptional. 😊 Highly recommended. The experience was amazing for my whole family of 5. My parents took 1 rickshaw and my hubby, me and my 1-year-old took another. We chose the half an hour one just for an experience since we also booked the kimono experience. Service from the staff was exceptional. 😊 Highly recommended. It's an amazing experience. Our guide, Kazu san is full passion and informative. He show us around area of interest and gave us brief history of that area. I'm recommending for those who want to try something new. It's an amazing experience. Our guide, Kazu san is full passion and informative. He show us around area of interest and gave us brief history of that area. I'm recommending for those who want to try something new. Our guide, Subaru is very good, his service is good and he is a great photographer. He explained each sightseeing check point very detail and he made my daughters very happy in the whole trip. His English is also good, we do not have any problem on the communication. Our guide, Subaru is very good, his service is good and he is a great photographer. He explained each sightseeing check point very detail and he made my daughters very happy in the whole trip. His English is also good, we do not have any problem on the communication. We booked a 30 minutes rickshaw on 3rd Nov and Yoshi was our guide. As a local Japanese, he can speak good English (at least far better than other local) and always trying to provide us as much information as possible around the neighborhood. And also most importantly, he takes good photos. 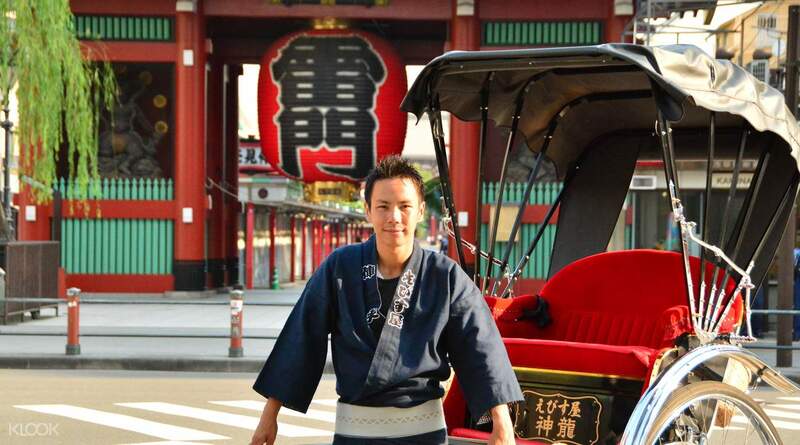 We booked a 30 minutes rickshaw on 3rd Nov and Yoshi was our guide. As a local Japanese, he can speak good English (at least far better than other local) and always trying to provide us as much information as possible around the neighborhood. And also most importantly, he takes good photos. Very knowledgeable. This is the must thing in Tokyo. Asakusa area is fantastic. Definitely, I will come again here! Very knowledgeable. This is the must thing in Tokyo. Asakusa area is fantastic. Definitely, I will come again here! overall i enjoyed, new experiences for me. my tour guide is knowledgable about historical old city and i like it. overall i enjoyed, new experiences for me. my tour guide is knowledgable about historical old city and i like it. Klooking is really my must do in all my travels, easy lining up and no need to worry when you have klook booking. We booked this tour for our parents and they definitely love the experience tho, they feel bad for the person who are carrying them. But definitely an experience. Klooking is really my must do in all my travels, easy lining up and no need to worry when you have klook booking. We booked this tour for our parents and they definitely love the experience tho, they feel bad for the person who are carrying them. But definitely an experience. We would like to thanks Kazuki, Taka and Shiro for completing our Japan trip with a bang! They were extremely courteous and genuine and we had a lot of fun on this tour. keep up the good work and keep on smiling! We would like to thanks Kazuki, Taka and Shiro for completing our Japan trip with a bang! They were extremely courteous and genuine and we had a lot of fun on this tour. keep up the good work and keep on smiling! Mr. Mochi was very nice and hardworking. He can speak english fluently and he told us that he study english in cebu, philippines for few months. Its very easy to communicate with him and he is always smiling. He is also very funny and we were really entertained by him. He provided a very good service. Whats funny is he can even edit our own picture taken by him during this activity! He is a pro! my husband and i had so much fun, really really fun. And also its very easy to find him because he has a tag with my name saying”, welcome (my name). We were late for few minutes but he patiently waited for us. We are very very grateful that Klook choose him to be our tour guide. Also, i asked him a lot of questions regarding his work and you will definitely realise that this guy is very passionate with his job. Thank you so much Mr. Mochi/ Mochizuki! Its nice having you as our tour guide! Mr. Mochi was very nice and hardworking. He can speak english fluently and he told us that he study english in cebu, philippines for few months. Its very easy to communicate with him and he is always smiling. He is also very funny and we were really entertained by him. He provided a very good service. Whats funny is he can even edit our own picture taken by him during this activity! He is a pro! my husband and i had so much fun, really really fun. And also its very easy to find him because he has a tag with my name saying”, welcome (my name). We were late for few minutes but he patiently waited for us. We are very very grateful that Klook choose him to be our tour guide. Also, i asked him a lot of questions regarding his work and you will definitely realise that this guy is very passionate with his job. Thank you so much Mr. Mochi/ Mochizuki! Its nice having you as our tour guide!